With the best leisure activities in VILLANUEVA DE AROSA all around it, the BRADOMIN HOTEL guarantees days bursting with life. It's 51 rooms offer customers a functional and pleasant environment. We offer Breakfast Service. Located in Vilanova de Arousa, Hotel Alpina is in the suburbs, within a 5-minute drive of Ría de Arousa and Valle-Inclan House Museum. This hotel is 1.8 mi (2.9 km) from Terron Beach and 3.1 mi (5 km) from Granbazan Winery. Credits cards accepted. Customers can park their car free of charge in the external car park. We offer Breakfast Service. We also have Discotheque. 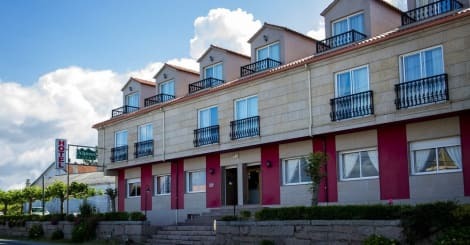 lastminute.com has a fantastic range of hotels in Vilanova de Arousa, with everything from cheap hotels to luxurious five star accommodation available. We like to live up to our last minute name so remember you can book any one of our excellent Vilanova de Arousa hotels up until midnight and stay the same night.